Book Repair and Bible Repair. Free shipping. they pick up their books. can be repaired and/or rebound. family heirloom, or a very personal, special, precious book. interconnected aspects: structural integrity and appearance. while protecting the pages with a covering. ribbons, cover design or embossing for decoration. Remove old brittle glue on spine. Reglue spine with bookbinders glue (PVA). Remove the front and back book hinges: cheesecloth fabric & endpapers. & plain or decorative/marbled endpapers. Mend torn pages with clear bookbinders glue. Corners of binders boards (cardboard) worn down. original boards be replace unless they are damaged beyond repair. spine title/design on the new material. Special requests will be honored. and would cost less to repair. result of the eventual decomposition of the bonded leather material. For examples of Bible and book repair, click here. For a detailed photo process of a typical book repair, click here. on a modem - a number of photos are included! 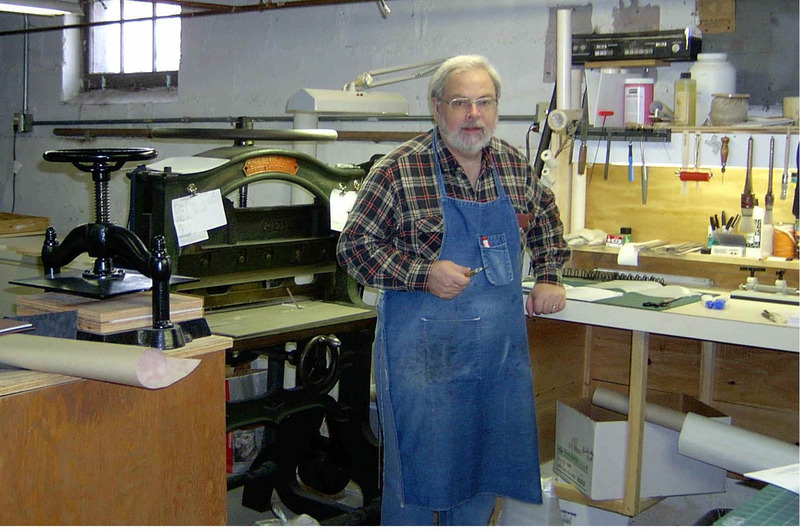 Steve has been doing hand bookbinding since 1964.